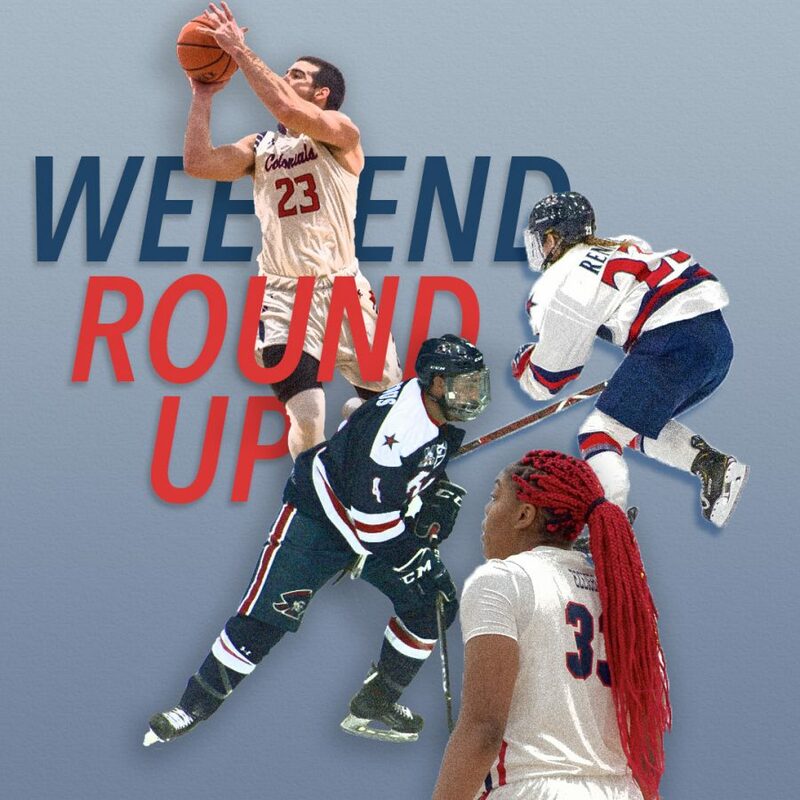 MOON TOWNSHIP — In what was a mild weekend for traveling Robert Morris sports teams, here is what happened for the away games to catch you up to speed. RMU men’s hockey (9-15-1, 8-10-1 AHA) didn’t fare well in game one against AHA rival Air Force Academy Falcons (12-9-4, 10-6-2 AHA) on Friday afternoon after they dropped the game 3-1. Beyond seeing RMU and Air Force receive only one penalty each in the first period, there was very little action until near the end of the period. Kieran Durgan opened the scoring of the game for Air Force at 19:43 with assists from Joe Tyran and Matt Koch in what proved to be the only goal of the first period for both teams. This left Air Force with a 1-0 lead over the Colonials. The second period was very much identical to that of the first period. Both teams had added another penalty and the Falcons scored another goal, which they did at 18:44, where Evan Feno scored with an assist from Evan Giesler to put Air Force up 2-0 by the end of the period. The third period is where Robert Morris finally got on the scoreboard, when they scored their only goal of the game on a power-play at 7:47 from Alex Tonge, who had assistance from Justin Addamo and Luke Lynch. This put RMU down 2-1 near the halfway mark. The Falcons sealed their victory after they scored later on at 19:12 thanks to Kyle Haak with the goal and Koch with the assist to win it 3-1. RMU men’s hockey (9-16-1, 8-11-1 AHA) didn’t see many different results on Saturday after the Air Force Academy Falcons (13-9-4, 11-6-3 AHA) handed the Colonials another 3-1 loss. In the first period, the Colonials were able to score early on because of Jacob Coleman’s goal, which was possible thanks to Michael Louria and Nick Prkusic with the assists to lead 1-0 at 4:55 on a power-play, but Robert Morris couldn’t look past that to score as Air Force scored the remaining goals of the game. This is partially due to RMU dealing with four penalties. The first goal from Air Force came at 13:51, scored by Walker Sommer with assists from Brady Tomlak and Max Harper. The period finished out with a 1-1 tie with Air Force dealing with three penalties. The second period was very quiet until 19:43 when Tomlak scored on a power play with assists from Sommer and Zach Mirageas to lead RMU 2-1 to end the period. Robert Morris dealt with two penalties while the Falcons had one. After finishing out the second period, the Falcons scored their last goal in the third period short-handed due to two Air Force penalties. Kyle Haak scored to win it 3-1 with backup from Evan Leno and Jake Levin. Robert Morris returns home to Colonials Arena for a brief home series against the Sacred Heart University Pioneers (7-13-3, 7-9-2 AHA) before going on the road again on February 1 and 2 at 7:05 p.m. and 4:05 p.m. respectively. At the VMI Keydet Invitational on Saturday, Kaitlyn Hawkins finished fifth in the women’s pole vault with a distance of 3.35 meters. Zoe Roush finished in fourth in the women’s long jump with a distance of 5.4 meters. Estelle Katende finished first in the women’s shot put with a distance of 14.34 meters. Madison Mueseler finished tenth in the women’s 400 meters with a time of 59.03 seconds. Lily Harnish finished third in the women’s high jump with a distance of 1.6 meters. Nicole Florio finished in ninth place in the women’s high jump as well with a distance of 1.5 meters. Track & Field participates in their next meet this coming Friday, Feb. 1 and Saturday, Feb. 2 all day in the YSU National Mid-Major Invitational.